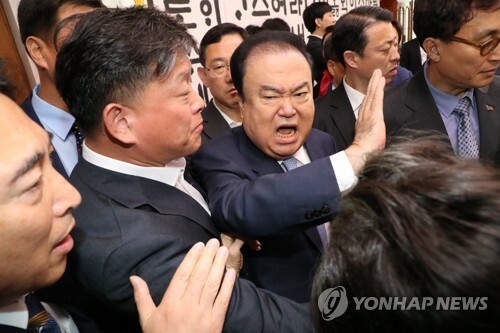 SEJONG -- South Korea's corporate watchdog said Thursday that it has decided to slap 260 million won (US$227,800) in fines on a local construction firm for violating subcontracting-related laws. According to the Fair Trade Commission (FTC), Woomi Construction Corp. had not paid some 370 million won to its subcontractors. The builder also did not meet debt guarantee requirements for some 100 subcontracted firms, the corporate watchdog said. The FTC ordered the company to take corrective measures. SEOUL -- South Korean stocks traded 2.63 percent lower late Thursday morning as investor sentiment took a hit from growth woes. The benchmark Korea Composite Stock Price Index (KOSPI) slumped 58.61 points to 2,170.00 as of 11:20 a.m.
Top-cap Samsung Electronics sank 2.65 percent, and its chipmaking rival SK hynix fell 1.42 percent. LG Chem, the largest chemicals and battery maker, lost 2.85 percent, and Kumho Petro Chemical declined 4.95 percent. SEOUL -- South Korean biopharmaceutical firm Celltrion Inc. said Thursday that an advisory committee for the U.S. Food and Drug Administration (FDA) recommended the approval of its biosimilar to treat certain kinds of cancer. The Oncologic Drugs Advisory Committee (ODAC) held a meeting on Wednesday (local time) and voted 16-0 for Truxima to be approved for use in the United States. The drug is based on Rituxan, originally developed by Swiss pharmaceutical giant Roche Holding Ltd. The FDA will take the committee's recommendation into consideration before giving the final greenlight, with the decision likely to be made by the end of the year, Celltrion said. SEOUL -- LG Electronics Inc. said Thursday that users of its artificial intelligence (AI) TVs are now able to use the Korean-language version of the Google Assistant voice recognition program. The South Korean tech giant said the LG OLED TV AI ThinQ and the Super Ultra HD TV ThinQ models are now capable of understanding local users. It marked the first time for TVs to adopt the Korean-language version of the Google Assistant program. LG Electronics first released AI TVs equipped with the English version of the system in May. The company said other newly introduced languages on its TVs include German, French and Spanish. SEOUL -- Gen. Park Han-ki, the new chairman of the Joint Chiefs Of Staff (JCS), took office Thursday, vowing to back up South Korea's ongoing peace efforts and strengthen military readiness and cooperation among all armed services. During his inauguration speech, the 41st JCS chief also stressed his pursuit of "technology-based elite forces" through Seoul's Defense Reform 2.0 initiative aimed at creating a smaller yet smarter military. "Now, the security situation on the Korean Peninsula is at a historical turning point where we are moving toward peace and prosperity after long periods of confrontation," he said. (LEAD) S. Korea's current account hits US$8.44 bln in Aug.
SEOUL -- South Korea's current account surplus continued to remain firmly in the black in August on brisk overseas sales, central bank data showed Thursday. The country's current account surplus came to US$8.44 billion in August, up from $6.03 billion in the black a year ago, according to the preliminary data from the Bank of Korea (BOK). From a month earlier, the August figure declined from a yearly high of $8.76 billion. Asia's fourth-largest economy has maintained a current account surplus for 78 straight months since March 2012. SEOUL -- Prosecutors raided the office and three other locations linked to a former Constitutional Court justice candidate Thursday as part of a probe into allegations that she pocketed hundreds of millions of won in ill-gotten profits via stock trading using confidential information. Investigators from the Seoul Southern District Prosecutors' Office searched the premises linked to Lee You-jung, a lawyer at One Law Partners, to collect evidence related to the allegations. Lee, 50, is accused of making a huge return by selling off some 10,000 shares in a local biotech company after it went public. Naturalendo Tech, the biotech company, was one of her law firm's clients, and prosecutors suspect she knew about their IPO plan before she bought the then unlisted stocks. WASHINGTON -- The United States hopes to hold working-level talks with North Korea soon to make progress on denuclearization and a second summit between U.S. President Donald Trump and North Korean leader Kim Jong-un, the State Department said Wednesday. Trump said Tuesday that the two sides are working to arrange a summit after the Nov. 6 midterm elections in one of three or four locations. Working-level talks would be led by U.S. Special Representative for North Korea Stephen Biegun and North Korean Vice Foreign Minister Choe Son-hui. "No trip announcements to make at this time, but that's something that we're looking at right now," department deputy spokesperson Robert Palladino said during a press briefing. "Hopefully soon," he added. "We'd like to continue progress moving forward.